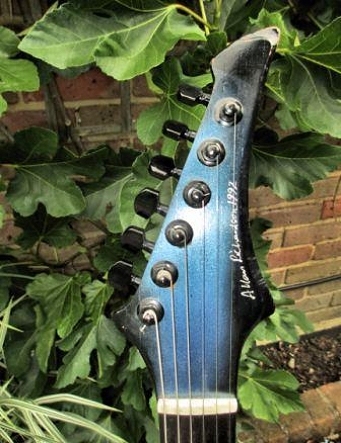 On this page you will find pictures of guitars and other instruments I have made over the years. 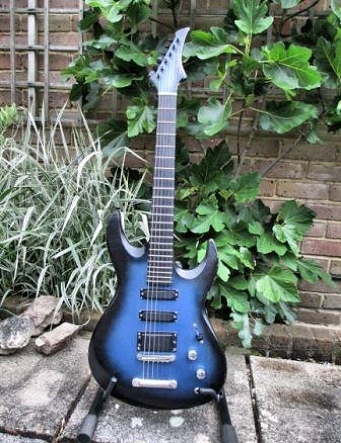 a small guitar made during the summer of 2013. 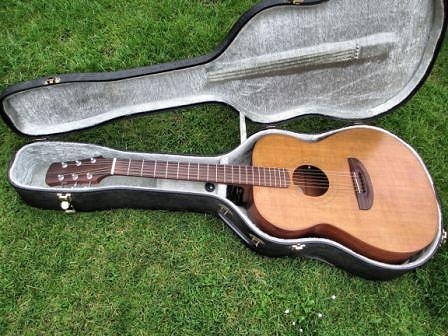 The giant plywood 12 string that started it all off in 1963. It still works and has a big jangly sound. The sound knobs are dummies added later for a magic trick which I did with the guitar. 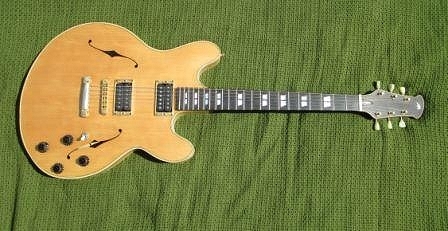 The second guitar, from 1964, as later fitted with a spruce top. 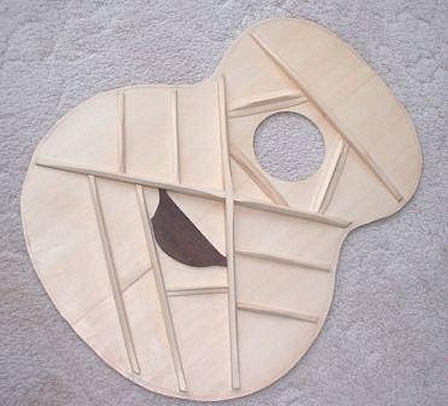 A rather square version of the "dreadnought" shape. Bright sound but a bit quiet because the body was quite stiff. 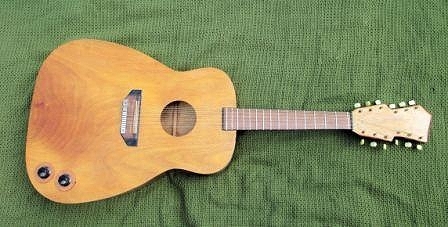 I made this more curvy acoustic guitar in 1988 at Tonbridge, at an instrument making course run by Ken Baddeley. 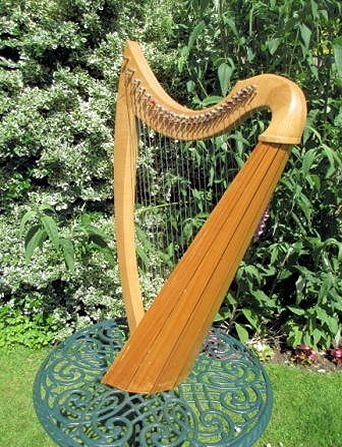 A harp made in 1990 when I was still going to the Tonbridge workshop. 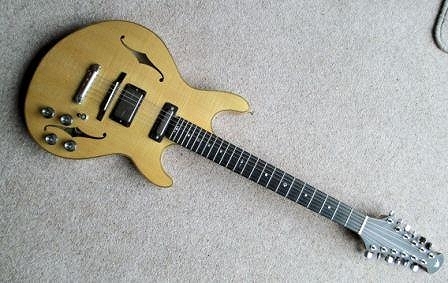 It sounds sweet - I only wish I could play it properly. 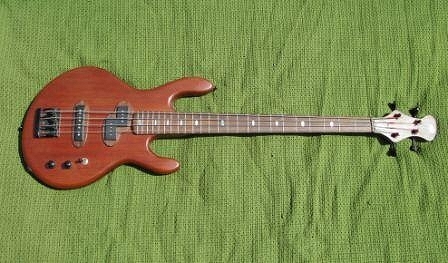 My first solid electric, made in 1992 using the mahogany from a discarded secondary window frame. With car spray paints and really cheap pickups it has a gutsy sound. Much used by my son Sam as a teenager. Guitars became almost an annual thing for a few years. This 12-string semi acoustic was from 1993. It has quite a sumptuous sound. In 1994 it was a bass guitar, made entirely of mahogany and rosewood, even down to the rosewood pickup surrounds and strap knobs. 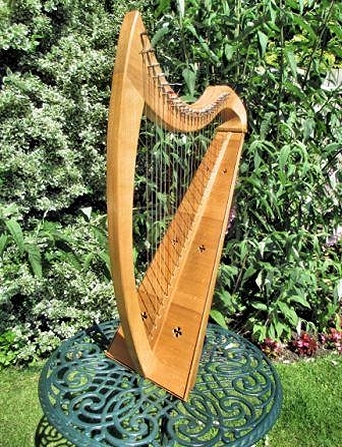 I attribute its warm sound to the wood. 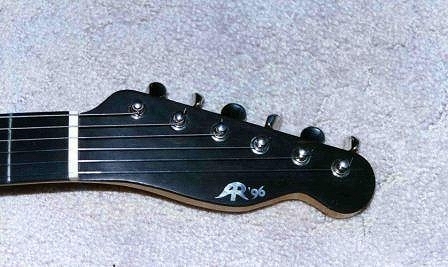 The 1995 guitar was a semi-acoustic with an offset shape. I played around with a variety of sounds with two Schaller twin coil pickups and coil taps. 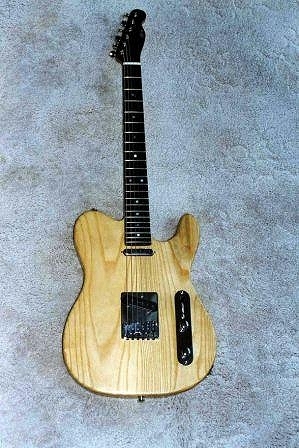 A telecaster in 1996, with Seymour-Duncan pickups and some "improvements" over the original Fender design, including a raked back headstock avoiding the use of a string tree to hold down the treble strings. 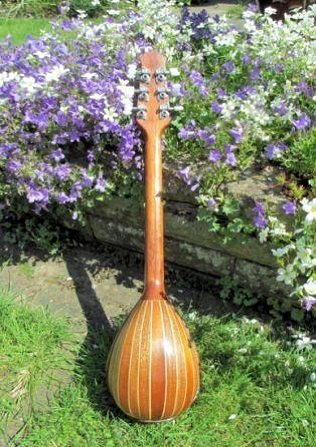 Sam still gigs with this instrument in his band Jakamo in Coventry. 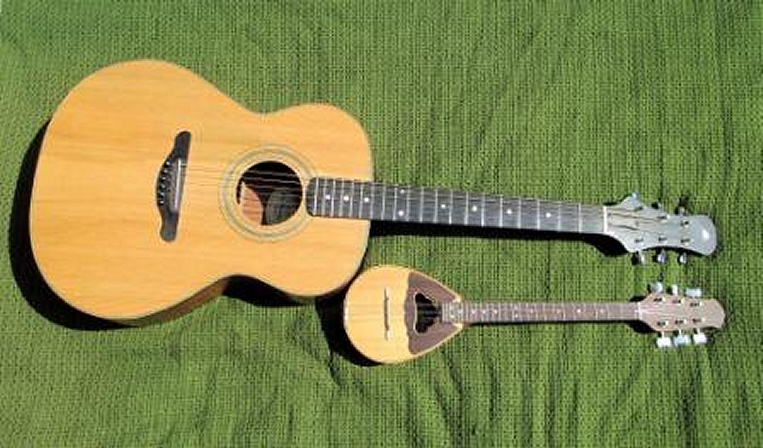 Two mandolins made in 1997, one with f-holes and the other an elliptical soundhole, but otherwise identical. Steve Shorey has one of these. It has a large flat body and a ringing tone. 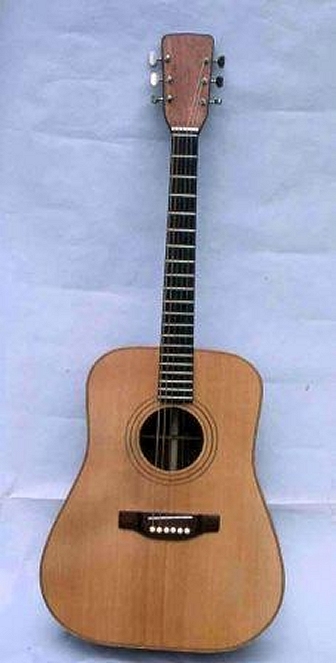 The guitar I use most is this mahogany and spruce bodied acoustic made in 2001. I made Sam a smilar one in rosewood. 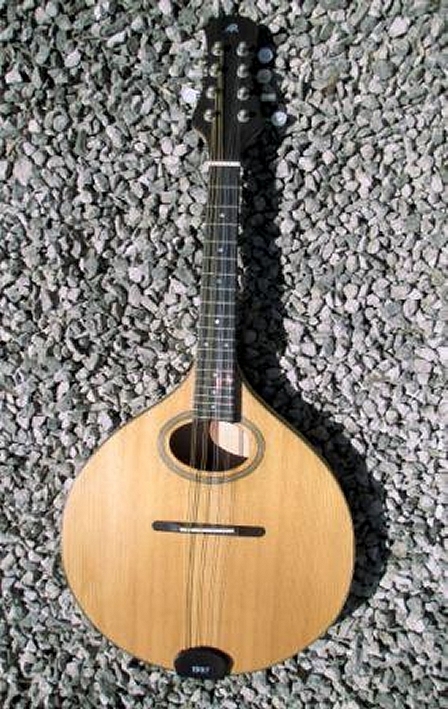 With it is a baglama - a very small Greek-style bouzouki made to use up offcuts of various woods in 2005. 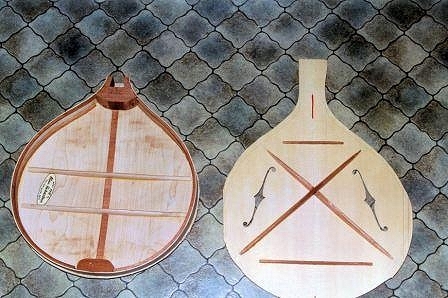 The back of the baglama is made from strips of mahogany with thin maple fillets between them. It is surprisingly loud for a little thing. 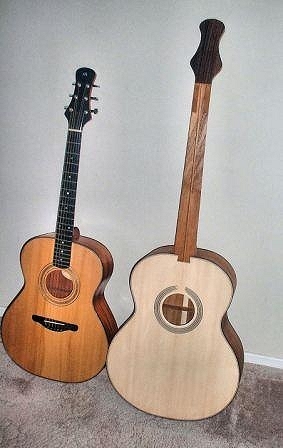 The 2001 acoustic again, with the partly completed acoustic bass guitar, showing the difference in size. The bass guitar soundboard is fairly thin but stoutly braced. 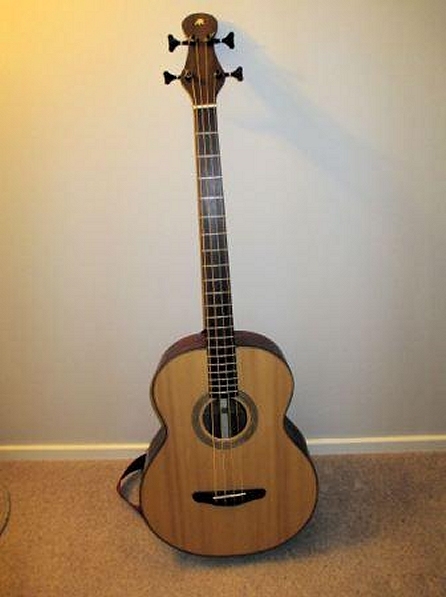 Completed early in 2013, a truly acoustic bass guitar. 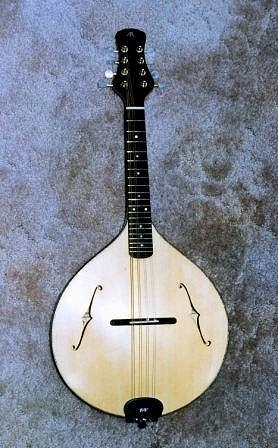 Thanks to the large hollow body it can hold its own with other acoustic instruments without needing to be plugged in. It has a bridge transducer if wanted, like a motor on a sailing dinghy.